Last week, I managed to get to the NZ National Library's current exhibition of satirical engravings, from William Hogarth [1767 - 1794] all of which are from the Alexander Turnbull collection. Headed Cautionary Tales, the exhibition gives a really interesting insight into one man's interpretation of the English tradition of satire that flourished through the first half of the 18th century. 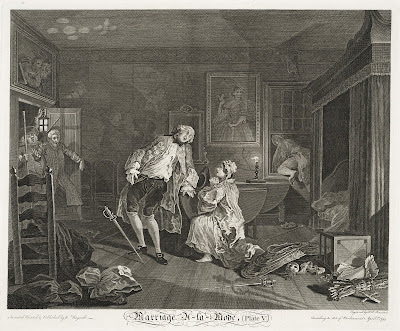 Well known for his popular engravings in the likes of 'Gin Lane' and the series 'The Harlot's Progress' and 'Marriage à-la-mode, Hogarth's work is filled with scenes of drunken debauchery, infidelities, and wanton acts of crime and violence. Most of it takes place in London, with the gallows of Tyburn never far away. In a neat twist, the exhibition also brings the key themes and formats up to date by including works by contemporary New Zealand cartoonists. One of these is the cartoonist David Low. He is credited with working the tradition of Hogarth, even producing a modern version of 'A Rake's Progress'. Also Trace Hodgson's series of 'Underbelly' cartoons are offered as a local contemporary take on Hogarth's satire of the streets, with Hodgson's heavily tattooed, chain-smoking bogans and their vegan girlfriends replacing Hogarth's cast of fashionable rakes and harlots. I also caught the evening lecture from Auckland Art Gallery senior curator Mary Kisler who gave an interesting and well research presentation on the theatrical connections of Hogarths work. As she explained, the Commedia dell'Arte [Wikipedia here] not only offered a brilliant framework to political and social subversion, the formula had developed a tradition of street theatre which survives right through to our modern notions of pantomime etc. Moreover, the characters have also endured, with the 18th Italian varieties, morphing into newer more localised characterisations in the likes of Punch and Judy. It was a lovely surprise of an evening. I also enjoyed watching the audience appear and dissolve into the Wellington night as if conjured out of mist by a sorcerer's apprentice. I've seen this effect before at the National Library Auditorium. The latter is in the basement - and is quite hard to find. However, once found it is surprisingly spacious. When I got there, there was hardly a soul around. I sat near the front, and sensed rather than saw the arrival of people around me. And then, as if I had been nudged, I looked behind me. The place was full. Just like that. Everyone, mostly older, but with a respectable smattering of the young gifted and slighty grubby, listened to the presentation with grave and polite attention, refused to a man/woman to detain Ms Kisler with anything as rude as a question, and then, as quietly and as a quickly as they had appeared, faded back into the rain. The exhibition is on until the 18th November. The online pages are here. Thank you for your post, I look for such article along time, today I find it finally. This post gives me lots of advice it is very useful for me, thank you for sharing...amazing post!